An output deal between the BBC and ABC will end after nearly 50 years following the announcement of a new BBC Drama and Comedy channel on Foxtel. Almost all the BBC Dramas and Comedies will shift to the new channel as Australian premieres, many which will be fast-tracked, and will only become available for Free to Air after 12 months. But the ABC is unhappy it was not consulted on the new deal. “In the past, the ABC has been able to point to our audience share, distinctive reach and the unique relationship between the two organisations, which has lasted 50 years,” an ABC spokesman said. “The ABC is disappointed that this decision was taken without any consultation. ABC’s contract with BBC ends mid-2014, when the new Pay TV channel will launch. In addition to Drama and Comedy, other BBC lifestyle programmes will also appear on other Pay TV channels. Other genres are not affected. ABC1 Channel Controller told TV Tonight, “We found out about the announcement on Tuesday, 24 hours before it was announced to the market. We are obviously very disappointed that our relationship appears to be coming to an end after nearly 50 years. We weren’t consulted by the BBC or invited to counter. TV Tonight understands the deal also affects prevents ‘grandfathering’ arrangement for current titles remaining with broadcasters, such as subsequent seasons of New Tricks and Call the Midwife, except for a handful of shows. TEN has a deal for Ripper Street and the Seven retains Citizen Khan, which premieres tonight. BBC believes viewers will still be able to access titles when many appear later on Free to Air, just as Nine’s Top Gear premieres first on BBC Knowledge. But industry sources tell TV Tonight that networks will be unlikely to want to pay for shows that viewers will have accessed elsewhere. I’m still confused, does that mean more new Programs on the existing UKTV BBC which I’ve payed for Recently. Or will the Existing BBC UKTv Channel be filled with repeats and no new Episodes or Programs. And will more programms be showing on this New Premium channel which will we have to Payout yet more money to watch at a premium? Are there any clear answers out there or are they just going to be cagey about pricing and Structure until the Actuall Channel is launched? Unclear which tier the new channel will be. Unclear what original content will remain with UKTV. There is great stuff on ITV at the moment. Broadchurch and Lightfields were very good. 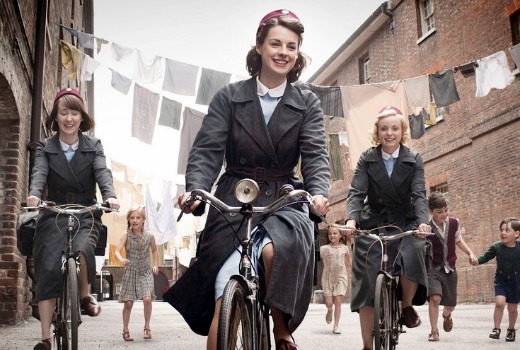 A series for the older viewers that would rate very well is The Bletchley Circle, again ITV and again from last year. A great female cast set in the 40s with a murder mystery. The BBC was very upset last year when it lost a lot of its shows due to a deal between the US and SKY. Now its doing the same thing here with Foxtel. Lots of UK shows I like but will not pay for it. Some great Aussie shows on or coming soon to fill the void. I hope ABC can pick up both Breathless and Broadchurch from ITV. Doctor Who already had a run of series agreement in place, so that is why it is remaining with the ABC. AMC has announced new programs today, so ABC should look to deal with them, and see if they can find the next Mad Men or Breaking Bad before Foxtel nabs them. Or maybe we will end up with a heap of cheap Canadian stuff. Fortunately, the BBC releases the DVDs/blu-rays as soon as the series ends, unlike the US, so business at Amazon UK will be booming. Still better value than Foxtel, with a second hand market as well. Apparently there is an iphone/ipad app you can use, but since I loathe anything with an “i” in front of it almost as much as I loathe Foxtel, you will have to test this for yourself. This isnt all to surprising. eventually this was bound to happen, although At the end of the day its all entertainment anyway so it does have a larger impact then what you or BBC claim. Its been happening in terms of sport for atleast a decade. The Ashes were only on FTA in the past and in recent years there are now on FTA and Pay Tv, same with the EPL SBS used to have the rights now they are exclusively with FOXtel. I do agree 100% that the FTA Networks will not be paying full price for content which was shown first on Pay Tv. In 2014 we could see a very different ABC in Prime time which is wear most of these shows are aired. I still have lots of questions: How long does this deal last with Foxtel (the last one with ABC went for three years)? Is it really just drama, comedy & lifestyle? What does this mean for BBC programs sold through ABC DVD (I want my money going back into ABC)? How the hell does Doctor Who remain with ABC1 (these pirates are always pampered at the expense of everyone else who doesn’t watch that primetime kids show)? Let’s remember Grand Designs (not a BBC program) & QI come to us through FremantleMedia, so they were never in doubt. But what about some Channel 4 programs like Alan Carr that is distributed through BBC? I’d like to remind the good people at ABC that this will most certainly impact on their ability to acquire content from ITV & Channel 4. That’s because other networks will be sniffing around for more first-run British programming, which will push the price higher. That said, ABC might have FTA BBC rights all to themselves now because Nine, Seven & TEN won’t be too keen on stuff that’s at least a year old… Most of the time. Hi David any news about Graham Norton staying on Free To Air TV ? Again… it is Drama, Comedy and Factual that is affected, not Entertainment. But I love British Drama. And I don’t have Foxtel. Does anyone know if this includes “Midsomer Murders”? I think it’s an ITV (Is that BBC)? “A lot of Australians who watch BBC programs on the ABC are elderly and probably on the pension. That’s a really incorrect statement to make. I’m 21 and the only channels I actually sit down and watch are ABC and SBS. Plus, it’s not just the elderly that can’t afford Foxtel either. Even if I could afford Foxtel, I wouldn’t buy it. This is really disappointing, spare a thought for those of us who live in regional areas who already get different content to city viewers. You’d go crazy watching Imparja! ABC is the only decent channel, mainly because it has a good mix of decent British, and Australian content. Worth remembering TV Tonight readers voted ABC1 as Channel of the Year in this year’s awards and I can tell you they were very very proud to win it …even as good as a Logie I was told! Not impressed. Esp not impressed that ABC weren’t given any options. No one will get Foxtel just to see BBC shows except maybe a few ex-pats. All will source the shows “elsewhere”. so will this spell the end of the stupid 13th street? with Foxtel teaming up with so many US and UK channels I think a channel overhaul is needed. for example an animation channel screening fox8 animations and animations on the comedy channel.